Comfort said finding clothes got really difficult just out of college when he had to start looking for professional clothing. Big and tall stores offered the length he liked, but the 2X and up sizing didn’t fit his athletic frame. “There wasn’t just a ‘tall’ store,” he said. But a few years ago when the 6-foot-5-inch tall and lean Comfort found a shirt that fit — really fit — with long sleeves and a slim torso, he wanted more. He set out to bring that fit to fellow tall men so they wouldn’t be left looking like they were wading in a pool of fabric two sizes too wide. After working his day job at an IT consulting firm out of Philadelphia, Comfort would come home and work on designs. 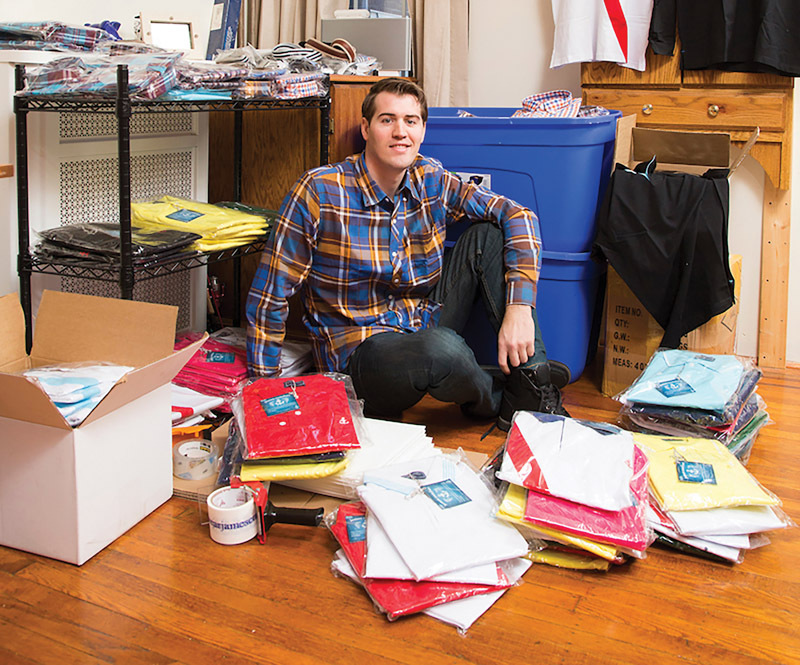 Leveraging what he knew of business and his background working part-time in a T-shirt shop in college, Comfort was able to use the overseas market to his advantage. After finding the high quality fabrics he loved through shows in New York, Comfort used an overseas producer to make his designs become an inventory of polos and laid-back plaids so men had options for work and play. “One of the ‘un-successes’ came during one of the first productions,” Comfort said about the trial and error of doing production in China. “They changed out the collar type on me, and it wasn’t the quality I’d set out to provide.” Comfort used friends and family to try his product and get the word out, even shipping product to family in Germany to sell at markets frequented by soldiers. Comfort’s shirts were also placed in a store in his hometown of Morris, Illinois, this past winter. Currently bins throughout his home and basement are filled with product, and he spends his evenings filling orders from his dining room table. “It’s a good feeling when you get something you really like,” he said.